What Is the Best Acog Scope Currently Available in the Market Today? Click here to see the Best Trijicon Acog available in 2017! The Trijicon ACOG or Acog (Advanced Combat Optical Gunsight) is quite the scope specimen to behold. It has quite a lot to offer that lives up to its lofty name, like the fact that it’s a line of combat-proven scopes that’s built to the highest standards of accuracy and intuitiveness while operating battery-free. There are many types you can choose from though, so we’ve narrowed it down to ten Acogs so that it’s easier to find the scope that suits your needs the most, separated by three categories: 4×32 ACOGs, 3.5×35 ACOGs, and 3×30 ACOGs. Trijicon Acog 4×32 Scope – .223/5.56 Red Donut Reticle – Fiber & Tritium Illumination- TA31: This Acog scope is part of the 4×32 ACOG series. The Trijicon Acog 4×32 Scope TA31 is the type of scope that the United States military favours. It has a donut-style reticle colored red, a 1.5 inch eye relief, a field of view of 37 feet at 100 yards, and you can add an RMR sight if you wish. It has no mount and can only be wielded as a carry mount. It can serve as a good ar 15 acog since it has 4x magnification and a 32 millimeter objective, hence their categorization. However, the 4×32 Acog scopes also have the shortest eye relief of all the ACOG categories featured here. The Trijicon Acog 4×32 Scope TA31 requires you to shoot with your nose at the charging handle, so you probably should watch out for firearms with a particularly powerful recoil or kick. There are advantages to this type of spec, though. You have the highest field of view thanks to the shorter eye relief and larger objective lens, which means when hunting for fast-moving varmints with this ar15 acog scope, you have more room to move your firearm around. The 4×32 is the ACOG for you if you want high magnification and wide field of view for your shooting and hunting needs that isn’t just plain sniping from far away. This model is dual-illuminated and made of forged aluminum to boot. 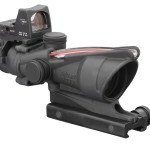 Trijicon Acog 4×32 Scope – .223/5.56 Red Triangle Reticle – Fiber & Tritium Illumination- TA31A: This Acog scope is part of the 4×32 ACOG series. It has the exact same price as the Trijicon Acog 4×32 Scope TA31. What’s more, the TA31A is pretty much the same as the TA31 specs wise—from its ar 15 acog carry mount to its 1.5 inch eye relief as well as 37 feet field of view at 100 yards—save for its triangle reticle style. It also includes the ACOGBAC Manual, Lenspen, 4x32Scopecoat, and carry handle screw and washer set. 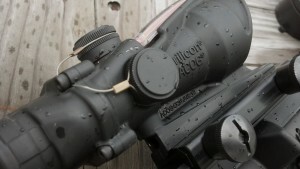 The Trijicon Acog 4×32 Scope TA31A also sports 0.223 calibration and forged aluminum housing material. You can consider this an expanded variant of the TA31 with an alternate reticle, essentially. This 5.8 inch ACOG is a combat-proven and battery free scope that enjoys the Acog legacy of having legendary durability few other scopes not of the ACOG line could duplicate. This is what makes the acog ar 15 special. The Trijicon Acog 4×32 Scope TA31A is a dual-illuminated beaut of a scope of the fiber and tritium variety that even features additional daytime illumination that enhances your vision in all the right ways so that you won’t get your lenses drowned out by light and glare. The Bindon Aiming Concept, meanwhile, makes it easy to center your scope to the target no matter how fast the object is moving. Trijicon Acog 4×32 Scope – .223/5.56 Green Chevron Reticle – Fiber & Tritium Illumination: This Acog scope is part of the 4×32 ACOG series. It’s more affordable than either TA31A or TA31A but more expensive than TA31F. Rated 4.4 out of 5 stars from 6 customers. Click the image for prices and reviews! It also epitomizes the epitome of a quality acog scope in its own way through its features like a red chevron reticle, a flattop mount absent in the previous two ACOGs. Its Picatinny TA51 mount is a sight to behold and really completes the whole TA31RMR package. It also has red crosshairs with BDC (Bullet Drop Compensation) reaching up to 600 yards and is a perfect fit for firearms like the Heckler and Koch MR556. The Trijicon Acog 4×32 Scope TA31RMR is quite handy for locating and shooting fast-moving targets thanks to the quality of its red dot sight. Under 50 meters CQB, it does everything it’s supposed to do and more. Because it’s an ACOG, few other non-ACOG optics within its same price range could match what it has to offer. That’s to be expected of all acog scopes, really. However, the TA31RMR is able to stand on its own with its ruggedized miniature reflex construction built from forged aluminum, resulting in a compact and lightweight scope that’s not at all cumbersome on your firearm. Its size is 7.3 inches by 6.6 inches by 3.5 inches and 2.3 pounds. Trijicon Acog 4×32 Scope – .223/5.56 Red Chevron Reticle – Fiber & Tritium Illumination w/ RMR Sight and Flattop Mount- TA31F: This Acog scope is part of the 4x32ACOG series. 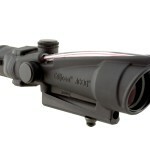 It’s probably the most affordable Acog4x32 Scope featured in this article. Rated 4.6 out of 5 stars from 14 customers. Click the image for prices and reviews! The Trijicon Acog 4×32 Scope TA31F features a red chevron Reticle and pretty much the same acog style scope specs as the TA31RMR package, except this time you’re getting it all at more of a couple of hundred dollars cheaper. The reason for this is because even with the same specs and the Picatinny flattop mount, it lacks certain specs from the TA31RMR, like the RMR or Ruggedized Miniature Reflex sight that ensures military-grade toughness and accuracy. So essentially, while it doesn’t include an RMR sight like TA31RMR does, the Trijicon Acog 4×32 Scope TA31Fis able to keep up by having most other specs that the tank of a scope TA31RMR also possessed, from both of them being 4×32 Scopes to the TA31F having 5.56 millimetre calibration for flattop rifles so that the ranging reticle of the product can reach out up to 800 meters. This acog scope for sale also has dual illumination that provides daylight and nighttime illumination by fiber optic and tritium specs respectively. The daylight lighting removes glare and the nighttime lighting maximizes light transmission. TheTA31F also has 36.8 feet at 100 yards field of view, a length of 5.8 inches, and the weight of 9.9 ounces. 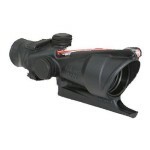 View all 4×32 Acog’s: click here! Trijicon Acog 3.5×35 Scope – .223/5.56 Red Donut Reticle – Fiber & Tritium Illumination- TA11: This Acog scope is part of the 3.5x35ACOG series. The Trijicon Acog 3.5×35 Scope TA11 has a donut reticle style, red reticle color, a 2.4 inch eye relief, 29 feet field of view at 100 yards, RMR sight can be added, and its mount is carry handle only. This trijicon acog scope and all other scopes within the 3.5×35 ACOGs category have 35 millimetre objective lens diameter and a 3.5 magnification. This is significant because with these specs you can get a field of view of 29 feet at 100 yards. Not as large as 4×32 ACOGs but plenty big enough. It’s the perfect tactical and scouting scope for low-range magnification operations where there’s more emphasis on close accuracy than long-range sniper precision. The TrijiconAcog3.5×35 Scope TA11 is also an awesome all-rounder kind of scope that balances eye relief, magnification, and view as far as ACOGs are concerned. The weight for (relatively) cheap acog scope this though is 18 ounces, which means it’s four ounces heavier than comparative lighter Acogs in this list. If you can tolerate the extra weight in this epitome of 3.5x35ACOGexcellence, then you’re good to go. A jack of all trades might be a master of none, but it’s usually better than a master of one. Trijicon Acog 3.5×35 Scope – .308 Red Donut Reticle – Fiber & Tritium Illumination- TA11C: This Acog scope is part of the 3.5x35ACOG series. The Trijicon Acog 3.5×35 Scope TA11C features essentially the same specs as TA11, from its reticle style to the kind of mount it accepts. The Trijicon Acog 3.5×35 Scope TA11C hits all the notes of the excellent TA11 perfectly and can be used as an airsoft acog scope to boot, which makes it amazingly versatile to boot. It’s even priced the same as the TA11. However, they’re not twins. The TA11C brings some things to the table that TA11 doesn’t, like a .308 reticle caliber for ballistics and lightning fast target acquisition. This is why the TA11C is favored by competitive shooters. Its optical quality cannot be denied and the whole package includes a warranty card, an ACOG BAC Manual, a Trijicon Logo Sticker of approval, a Landyard Assembly for Adjuster Caps, a LensPen, ascopecoat for 3.5×35 Acogs, a washer set, and a carry handle screw. 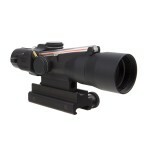 This acog scope review has faith in the capabilities of the TA11C. It’s advantageous to have donut-shaped reticles for the TA11 and TA11C because the target isn’t masked or covered, giving you more pinpoint accuracy for up to 800 meters (although your mileage might vary since some marksmen prefer to have a dot or a x mark the spot; sometimes it’s a matter of preference, other times it’s a matter of what you’re used to). Trijicon Acog 3.5×35 Scope – .308 Red Chevron Reticle – Fiber & Tritium Illumination w/ Flattop Mount- TA11E: This Acog scope is part of the 3.5×35 ACOG series. Rated 4.8 out of 5 stars from 5 customers. Click the image for prices and reviews! This particular 3.5×35 ACOG offers a red chevron reticle this time around, which means you get an arrow-head, upside-down v-shaped reticle favoured by the military. So what is an acog scope? What does Advanced Combat Optical Gunsight really mean? You can find the answers and more with the Trijicon Acog 3.5×35 Scope TA11E. First off, the gunsight is filled with quality, light-maximizing lens that ensure your brightness transmission is excellent, particularly with its dual daytime and nighttime illumination through fiber and tritium tech. If it’s daytime, there’s less glare. If it’s nighttime, the scope transmits all the light it could gather from the surroundings. This particular scope also includes a flattop adapter since it’s calibrated for .308 cal or 7.62 flattop rifles for up to 800 meters. Meanwhile, the reticle was developed to ensure that you can zero-in on your target using the tip at 100 meters. There’s about 5.53 MOA at the base of the chevron reticle as well, which means you get 19 inches at 300 meters of accuracy, thus allowing range estimation for targets that are mere silhouettes on your scope. The Trijicon Acog 3.5×35 Scope TA11E truly delivers when it comes to showcasing military-grade tactical excellence that’s hard to beat. 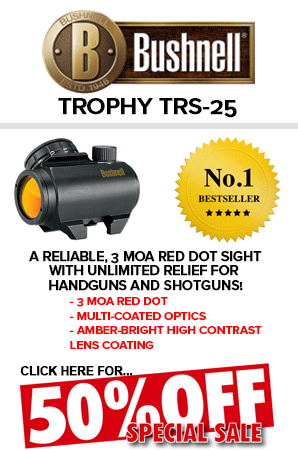 View all 3.5×35 Acog’s: click here! Trijicon Acog 3×30 Scope – .223/5.56 Amber Chevron Reticle – Fiber & Tritium Illumination w/ Flattop Mount- TA33-8: This Acog scope is part of the 3×30 ACOG series. The TA33-8 delivers an amber chevron reticle, a 1.9 to 3.5 inch eye relief, 20 feet field of view at 100 yards, the option to add an RMR sight, a Picatinny TA60 Mount, and a .223/5.56 reticle caliber that it shares with TA33G-H. Rated 4.6 out of 5 stars from over 9 customers. Click the image for prices and reviews! With its 30 millimeter objective and 3x magnification, it’s more of a pure close-range shooter kind of scout scope, but this time it’s the ACOG edition of such a product. This gives you some extra accuracy features you won’t get from an ordinary scout scope. Eye relief is the name of the game for Trijicon, which is also what you need for pistol or handgun scopes as well as certain long-nosed rifle guns that have the scope located far from where your hammer or trigger is. There’s a minimum 1.9 eye relief that can extend all the way to 4 inches without worrying about a blurry image at the exit pupil or the scope hitting you in the eye after recoil. You have to trade this superior eye relief with a smaller field of view of 20 feet at 100 yards, which is half what you’d get from any of the 4×32 ACOG scope models. This is the scope to beat if you want long eye relief from a lightweight tactical scope. Trijicon Acog 3×30 Scope – .308 Amber Chevron Reticle – Fiber & Tritium Illumination w/ Flattop Mount- TA33-9: This Acog scope is part of the 3×30 ACOG series. It pretty much mirrors the TA33-8 in terms of specs from reticle to mount. However, it differs in terms of reticle caliber, which is .308. Rated 5 out of 5 stars from over 5 customers. Click the image for prices and reviews! The TrijiconAcog3x30 Scope TA33-9 is more of a soldier’s scope than the TA33-8 mostly because of its different caliber and other unique specs, such as its accessories like the Box Pack 1471, sheath open frame design, and free Gerber Suspension Multiplier, among other accessories that enhance and smoothen the operation of the scope’s Amber Chevron .308 Ballistic Reticle TA33-9. Law enforcers and the military also favour the Trijicon Acog 3×30 Scope TA33-9 because of its combination of long eye relief (since most cops use pistols and many military men carry handguns as a sidearm), low light capabilities, and ample magnification on close-range (you don’t need to go overboard with sniper-level 80x magnification to get crystal clear magnification at 3x). This TA33-9 TrijiconAcog proves itself as the scope of choice from day to night (like all ACOGs) and from one military-grade firearm to another. You just can’t beat its 1.9-4 inch eye relief, 10 millimeter exit pupil size, 3x magnification, 6.1 inch length, 19.3 feet field of view at 100 yards, and 4 clicks adjustment at 100 yards. Trijicon Acog 3×30 Scope – .223/5.56 Green Horseshoe/Dot Reticle – Fiber & Tritium Illumination w/ Flattop Mount- TA33G-H: This Acog scope is part of the 3×30 ACOG series. It pretty much mirrors the TA33-8 and TA33-9 in terms of specs from eye relief to mount. It has a different reticle though—a green horseshoe or dot reticle that gives more shooting leeway—and a .223/5.56 reticle caliber that it shares with TA33-8 but not TA33-9. It’s priced the same as all the other 3×30 ACOGs, but that doesn’t mean it’s exactly the same as they are. It’s shoots long and can do close-range scout scoping as well. Like the TA33-9, it’s a military-grade scope that’s also used by law enforcement due to the universal long eye relief provided by all 3×30 Trijicon scopes. However, that’s not all it has to offer. It’s also a Dual Illumination Green Horseshoe/Dot .223 Ballistic Reticle scope that proves to be the most versatile scope in its category. It can even do longer distance shooting and even CQB if needed, plus the green reticle is useful as an all-around color (it’s a bright green color so you need not worry about it blending at an evergreen forest or anything). 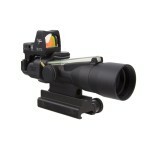 View all 3×30 Acog’s: click here! Universally speaking, these ACOGs offer ruggedness of the highest order. Trijicon has made a scope line so distinctive, non-Trijicon Acog-like scopes are popping up in the market that do their best to duplicate the product’s ruggedness and military-grade specs. 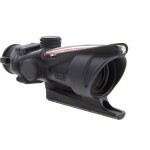 When it comes to looking for the best acog scope, keep your eyes peeled. All these Acogs are worth every penny, but to choose one over the other, you need to define your needs. 3×30 ACOGs offer the most eye relief and smallest exit pupil. 4×32 ACOGs is all about huge field of view for fast-moving targets. The 3.5×35 ACOGs are the midway options.